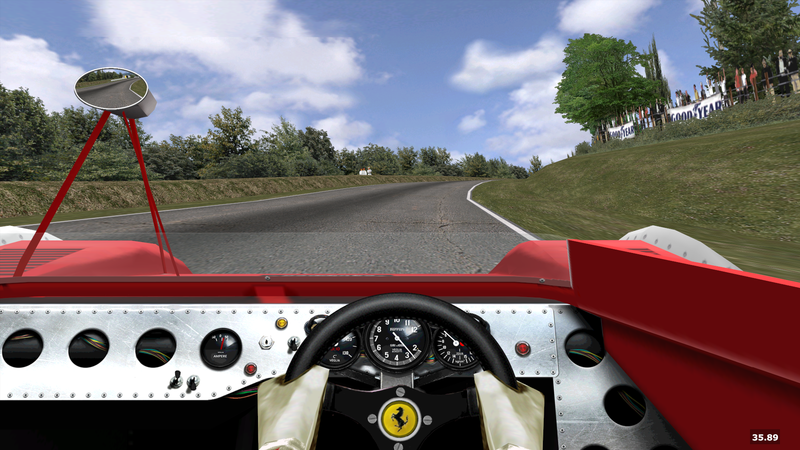 I have made a small update for the 712M cockpit. It's just the telltale removed, which was never there in real life, and the rev needle made slightly longer to match real size Plus driving view has been lowered just a little bit to provide a more realistic setup. There were plans to add the correct needle texture for the tach as I did for the '67 312, but unfortunately the new needle moves around the wrong center of rotation. Which is something that can only be corrected by someone who knows how to move around these things. Since the mirror needs to be fixed too, since it has the wrong shape (textures are ready for that too), if someone who has the knowledge of how to deeply modify 3dos would like to help please say it As I said, textures and implementation of the new needle are all ready to go. Edited by leon_90, Nov 17 2017 - 05:57 AM. Edited by Stefan Roess, Nov 17 2017 - 07:12 AM. Leon, nice job on the Ferrari 712 tach. Where did you get those amazing textures? My Mont Tremblant looks nothing like that. It's a personal modification I made for private use I merely fixed a couple issues with grass, asphalt and sand, and put a new horizon. exactly! That was my starting point go grab it guys!! As I built the Can-Am 66 website I should already have this update. Guess I have to enjoy Leon`s update with the St Jovite - Mont Tremblant track update to refresh my memory. Edit: @the Can-Am 66 mod team: Shall I update the website with Leon`s cockpit update? Are there any other udpates I might have missed that should be added to the website? Edited by Stefan Roess, Nov 21 2017 - 02:57 AM. Edited by Stefan Roess, Nov 21 2017 - 08:34 AM.